These Farm Heroes level 193 cheats and tips will help you beat level 193 of Farm Heroes. 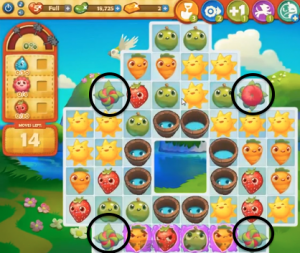 The objective of Farm Heroes level 193 is to achieve 100% growth and collect 50 water droplets, 4 flowers, and 30 strawberries in 15 moves. Start Farm Heroes Saga Level 193 by making matches next to the flowers to collect them. If you can, try to make matches with just strawberries, so that you can work towards two goals at once; however, it is not essential. You want to eliminate the flowers sooner rather than later because there is no way to tell how long it will take to collect each one, and you don’t want to be caught with too few moves at the end. Strawberries don’t come down as often as other cropsies on this level, so you want to take advantage of collecting them when you can. 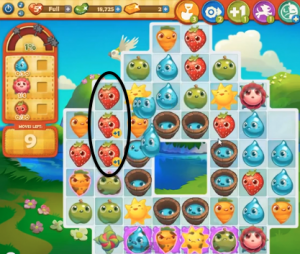 Be sure to avoid matching good strawberries with grumpy strawberries, because the match will not count towards your goal. Don’t give the water droplet goal too much thought. 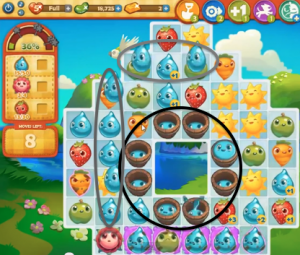 There are a huge amount of water buckets that will spew water across the board quite often, and there is a good chance that matches will form on their own when this happens, fulfilling your Farm Heroes Saga Level 193 goal automatically.